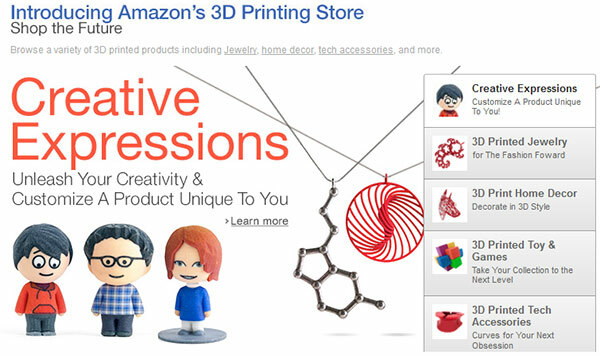 Amazon has launched a 3D printing store for the users of Amazon.com. The new online store allows customers to make use of Amazon's 3D printing services to design and purchase custom bobble head dolls, fashion jewellery, home décor, toys and tech accessories. The customisable 3D printing service can offer you products on Amazon that might otherwise be unavailable. In all there's over 200 unique designs, we are told, which you can further customise with text and graphic elements of your choosing. "The introduction of our 3D Printed Products store suggests the beginnings of a shift in online retail - that manufacturing can be more nimble to provide an immersive customer experience. Sellers, in alignment with designers and manufacturers, can offer more dynamic inventory for customers to personalize and truly make their own," said Petra Schindler-Carter, Director for Amazon Marketplace Sales. "The personalization widget empowers customers to make something unique in seconds"
"Gives customers the power to remix their world"
"The online customer shopping experience will be redefined"
But in the store there is little to inspire but a selection of plastic (and some metal) tat upon which you can get your name embossed. Many of the items resemble stuff you might find in a Christmas cracker, especially the 'fashion jewellery' and 'home décor' items. I had a quick tinker around the customisation panels on the store and was a little bit disappointed that you couldn't upload vector logo art, for example, you have to pick from a standard set of component designs, symbols and/or the alphabet. The personalisation options seem particularly weak on some items. Looking at the 'Create Your Own' 3D Printed Wax Seal which costs US$42, the personalisation only allows you to choose up to two English letters and one of three cosmetic finishes for the piece. While the Amazon store functions pretty well I have previously used online product printing stores such as Zazzle to get much more interestingly customised printed products. Such online print firms can use your own graphics and illustrations on products that while not 3D printed are definitely 3D objects, of course. Companies including Sculpteo, headquartered in San Francisco and Paris and 3DLT, headquartered in the Cincinnati, Ohio provide the tech behind Amazon's new venture. We are also told that 3D designers can use the store as "an entry point for designers to offer print on-demand product designs". If you are such a person you can contact Amazon via this form to enquire about partnership possibilities. We don't know when or if the Amazon 3D printing store will come to the UK. Being Amazon, I was expecting an actual 3D Printing service - upload your own designs - receive them in a couple of days for a competitive price.. 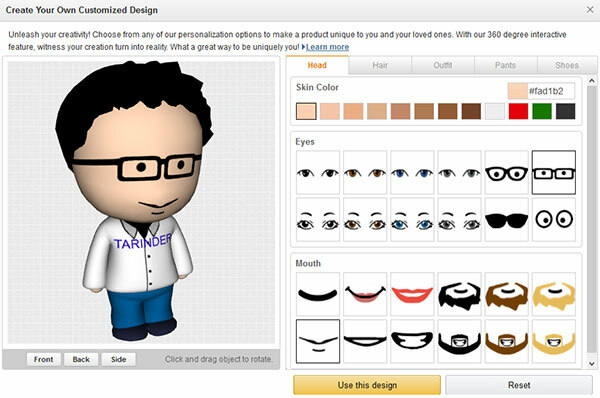 Instead it's just a “make your own Mii” service. Disappointed. To be fair, this sits in with Amazons market place idea much better. They're effectively letting others do the hard work and taking a slice, much like the marketplace ‘sellers’ now. It would have been so easy for Amazon to have setup an amazingly useful service (send them your designs in DXF format and, if it meets certain criteria related to size and shape, they accept it and 3D print it for you), but instead they go and make this non-sense. I just don't get it. They probably will, but 3D printing is still a bit immature. Give it another year or two for large scale industrial machines (of which currently, there are not very many) to mature, and they probably will.